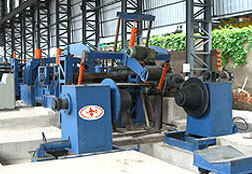 Slitting Line functions as a constant speed type. Firstly, the coil is loaded on the coil car by E.O.T. crane and brought to the uncoiler by operating the coil car. Coil car centralizes the coil with the uncoiler mandrel and the coil is mounted on the uncoiler which results in the expansion of Mandrel. The Snubber roll rotates the coil. Peeler breaks the straps and brings the pre end upto Pinch roll. The Pinch roll drives the coil end upto the slitter. Then its drive is disconnected. Slitter moves the Slitted Strips further. Slitted Lines are threaded through loop table and drag tensioner into the recoiler drum. Recoiler winds one turn on loose coil. Then drag tensioner and loop are put into operation. Slitter and recoiler run simultaneously in synchronization. As the coil build up, the recoiler RPM correspondingly goes down to keep desired constant line speed. This process goes on until the end of coil on uncoiler. The Slitted coil is pushed on the exit coil car trolley through a pusher plate operated by hydraulic cylinder. The side Slitted Scrap is wound on the scrap winder units provided on both sides of the slitter.